A few months back, I reviewed Joel Christian Gill's biography of Bessie Stringfield. I was certainly encouraged enough to track down the first volume of the series, featuring a biography of Bass Reeves, "the most successful lawman in the Old West!" The story begins in the 1840s, with Reeves as a child. As America was still several years away from the Emancipation Proclamation, Reeves was owned by a white man who taught him how to fire a rifle so that he could enter the boy in shooting competitions and clean up on bets. After all, who would bet on a Black boy? Reeves grew up like this, but eventually fled during the Civil War and lived with a tribe of Native Americans for a while before joining a platoon of Black Union soldiers. Reeves' sense of justice and fairness earned him a position alongside some Oklahoma deputies and eventually led to him becoming a full US Marshal. He was incredibly effective in the role, ultimately bringing in over 3,000 outlaws over his career, thanks in part to his aim and in part to his overall approach, which often involved sneaking up on his targets in some form of disguise. He did marry and have a son, but he spent much of his time on the roads and didn't see them often, instead travelling with a Native American companion. I couldn't have pegged Reeves' name for anything a week ago. But after maybe a dozen pages or so, I realized the story sounded just familiar enough that I thought I'd heard it before. And another dozen pages, it dawned on me that I was reading a biography of the real life inspiration for the Lone Ranger. Gill doesn't make that connection obvious until the very end of the book, reflecting perhaps that the connection isn't entirely confirmed. 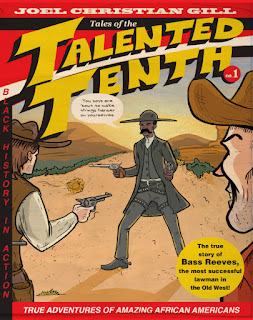 While Gill simply recounts Reeves' life, as opposed to actively trying to make a case for the lawman being an inspiration for the character, the details he provides definitely give the reader something of an a-ha moment when the Lone Ranger idea is finally mentioned on the last page of the story. Whether or not Reeves did serve as the model for the Lone Ranger is moot, though, as his life is pretty compelling on the face of it. Having grown up a slave, and literally fighting his way out of that life is no small feat by itself. But then to assume a position of authority in a relatively lawless area, as a man who is frequently hated because of the color of his skin... well, that's super impressive. Couple that with being successful? The man would be a big damn hero even if the Lone Ranger was never created! Gill's storytelling is solid for the most part. I did feel one scene in which Reeves accidentally kills a cook was a little oddly staged; I'm not sure if that was deliberate to emphasize how the subsequent trial could go either way, but I don't know that keeping that part deliberately ambiguous was necessary. After all, a Black man killing a white man in the 1880s would all but guarantee a guilty verdict regardless of the circumstances. Showing readers the actual events clearly wouldn't have changed that. It's a relatively minor story point to nitpick over, especially since Gill makes it clear what happens with the dialogue, but it did catch me off-guard a bit. Nevertheless, the book is solid overall, and I'm looking forward to whenever Gill is able to get the next one complete. It looks like that might be about Robert Smalls or Mary Bowser, both of whom sound like great subjects! We definitely need more books like these out there and available, and I suggest you pick this and his Bessie Stringfield biography up. I have this book. I met him at ALA Annual in Las Vegas in 2014 and got it directly from him.